#298 Asphalt Emulsion may be used as a surface protectant or as a waterproofing compound using polyester and or fiberglass reinforcements. Applied as a roof protectant, #298 Asphalt Emulsion’s unique formulation allows the film to “breathe” while drying and is waterproof upon curing. Roof surfaces protected or surface primed with #298 Asphalt Emulsion are especially suited for application of Western Colloid #525 SilverWhite Aluminum Reflective Coating. #298 Asphalt Emulsion is water based and can be applied to most clean (dust and oil free) surfaces. It can be applied to dry or damp (not wet) surfaces using rollers, knotted brushes, squeegees or spray equipment. If you need assistance with the application of this product or need assistance with choosing equipment for the proper application of #298 Asphalt Emulsion, contact Western Colloid. #298 Asphalt Emulsion is available in an elastomeric (298E) blend. #298 Asphalt Emulsion is the principle component in our Fluid Applied Reinforced Roofing systems and Glas-Shield roof systems. 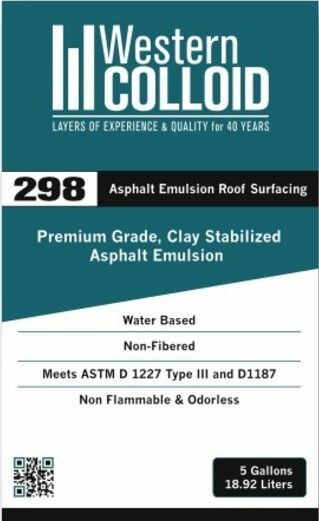 #298 Asphalt Emulsion is the primary waterproofing component of many UL Class A and Factory Mutual Class 1 roofing systems. Western Colloid’s #298 Asphalt Emulsion is an asphaltic bentonite clay emulsion for use as a waterproofing compound and surface coating. When cured, #298 Asphalt Emulsion resists checking and cracking. The dry film remains flexible and will not sag, flow or re-emulsify. Special unblown soft asphalts help improve the weathering characteristics of Product #298 as well as enhance resistance to industrial pollutants, contaminants and corrosives. A uniform weathering surface for smooth or mineral surfaced composition built-up roofing. A waterproofing compound for cold process, built-up roof systems utilizing polyester and or fiberglass reinforcements. A protective surface for metal roofing, masonry, stucco, parapet walls, curbs and base flashings. A base coat for #525 SilverWhite reflective coating. A corrosion resistant base coat for most exterior metal surfaces. A damp proofing compound for below grade walls.